For quite some time now I’ve been following The Textile Blog. I found it especially useful when I was studying the history of embroidery for City & Guilds. Last week John Hopper who writes and edits the blog, announced the launch of an online magazine entitled ‘Inspirational’. It will feature the work of artists working in many disciplines – not only textiles. All the articles will be written by John Hopper which, I suppose, could make it a bit repetitive, although I don’t find the blog repetitive. The magazine will be set up as a paid-for subscription, and I may decide (depending on the price) to subscribe. It looks like a worthwhile enterprise and I’d like to support it if possible. Have just got to the end of a lot of work, and have had a few family problems to deal with recently, hence the minimal approach to blogging. Must try harder…. Visual texture… crumbling and peeling and staining…. I took this photograph earlier in the year on a visit to the north-east coast of England. Exterior paintwork doesn’t stand much of a chance in this climate; this is the interior of a shelter on the seafront at Whitley Bay which is exposed to the wind from the sea at all times. We were at Whitley Bay again last weekend which is what made me think about the series of photographs that I took. I found them today on Picasa and decided to crop one and feature it in today’s post. 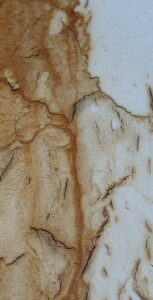 The photograph is much larger than this, but I like using Picasa’s cropping feature to home in on detail like this. I’ve not done much stitching at all recently. I’m busy with work but also trying to fit in home and garden maintenance. Last week I bought 350 tulip bulbs and 100 allium bulbs. Planting these turns out to be a lot of work, but if they all come up the garden will look spectacular in the spring (a photo will, of course, follow on this blog provided it does look good). So far I’ve planted around 1/3 of the bulbs, so there’s a long way to go and not much time before we set off for our holiday next week. Will try to keep posting – lots of people look at this site now, and I feel ashamed and laggardly when I don’t write two posts per week. Must try harder…..
Another day, another art gallery…..
Oops, it’s a week since I last posted. What happened to the week? Where did the time go? I usually feel like this at the end of a week, but today even more so. There were a few rather featureless days early in the week when I was just plugging away at work. But life improved towards the end of the week. My husband had a business meeting in Newcastle on Friday, so I decided to go with him and we elaborated the plan to include an overnight stay and a meal out. While he was at the meeting on Friday morning I wandered off to the excellent Newcastle retail offer and had a good time shopping for winter boots. An odd purchase on such a warm and beautiful day, but the boot shop assistant remarked that boots are selling out fast despite the gorgeous weather. So there you are – if you want new boots this winter this may be the time to get them. It’s not like me to be so well-organised – I’d usually be the one traipsing in after they’d sold out – so I was pleased. Now I suppose I must throw out the old ones which are bashed about, and one of which has a large hole in the toe. (Why is this woman wittering on about boots? I hear you ask). To get to the point, then, on Friday afternoon, it was off to yet another art gallery. Husband is also a keen art hound and, as regards Newcastle, he is ahead of me in that he has recently visited this gallery. 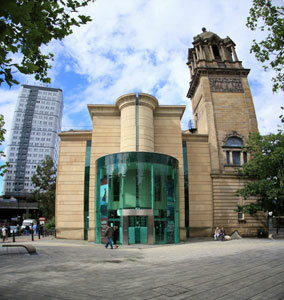 It’s called the Laing, and it’s near the City Centre (here’s a photo). Well, it was great. There was an exhibition of paintings related to the First World War. 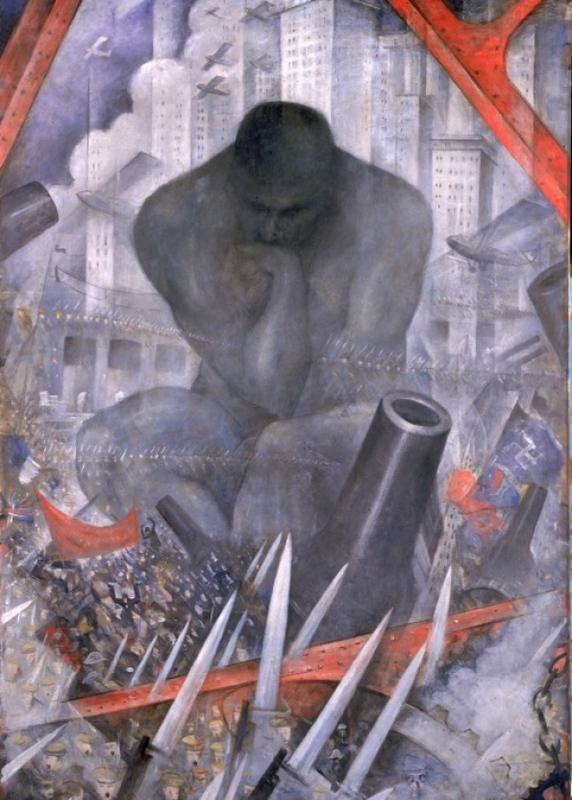 Nothing truly remarkable, but a thought-provoking CWR Nevinson, ‘Restless Times’ featuring Rodin’s thinker and an assault upon thinking and values. Very striking. There was also an exhibition curated by Jeremy Deller entitled ‘All That is Solid Melts Into Air’. This exhibition was put together around the theme of the Industrial Revolution and its impact on popular culture. All the cities of Northern England still bear the scars of the Industrial Revolution, although some more than others. In Lancashire the old mills are a continual reminder of the way of life of many of our forebears (including my own, many of whom were mill workers). In the coal-mining areas the tangible evidence tends to be less obvious because much of the land has been reclaimed, and quite right too. This is a touring exhibition that started in Manchester and which I think has already been to Coventry and Nottingham. I think Newcastle may be its last venue so unless you happen to be there I guess you’re not going to see it. I’m pleased I caught it. The week ahead contains yet more work (it’s a constant, unfortunately), but there’ll be time for other things too. I’ve spent much of today in the garden in gorgeous autumn sunshine, soaking it up before winter comes. When the sun gets lower and the light more slanty as it does in the autumn here, the green is especially lovely. And, because there’s been a lot of rain (as usual) it really is a lovely saturated green. Wish I could capture it in a photo. Perhaps I’ll have a go if we get another day like this…..